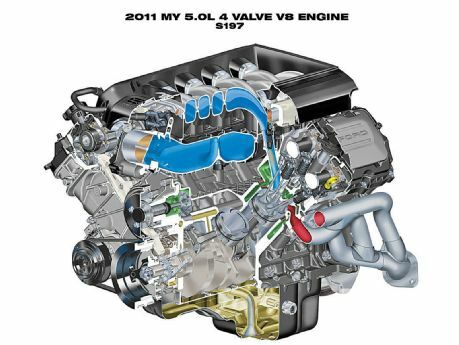 Now that we know the new Coyote 5 liter for 2011 is a completely new engine, not a re-worked modular motor, it’s time to review some of the highlights of Ford’s past engine development efforts that should have been included with the Coyote. 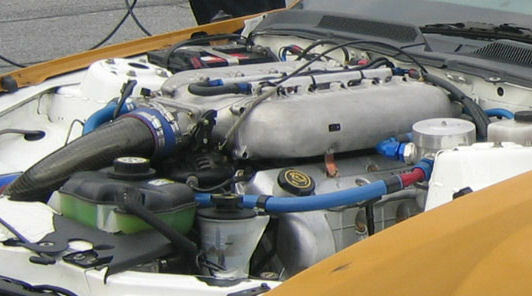 First is the R50 engine – the 5 liter race version of the DOHC “Cammer” modular engine used in the FR500C Grand Am Cup race car. With the latest Ford GT cylinder heads and an 11:1 compression ratio this engine was said to produce 400 HP and 400 torque. Dyno charts were never made available and the engine was never EPA certified. However, judging from the intake manifold with it’s obvious long cross-runners, this design focused on high-RPM breathing at the expense of low end. At $29,990 list, this is hardly something an enthusiast would shell out for. 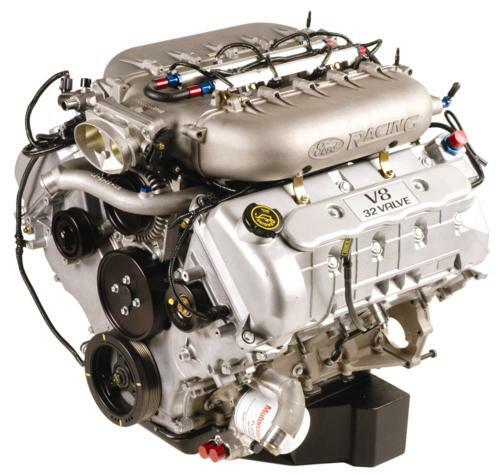 The rest of the engine can be built for far less than half this cost. It would be nice if Ford would make the intake available. 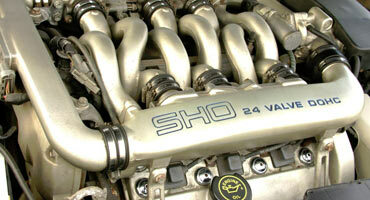 Next is the original V-6 Taurus SHO Yamaha-designed and built engine. The addition of this intake manifold to an otherwise reasonably tuned engine resulted in phenomenal horsepower and drivability for it’s time. With both long and short runners, the engine made power over the entire band and sustained it wherever the driver needed it. The engine was capable of 9000 RPM, but the accessories were not. It was an expensive intake manifold to produce, and the excessive number of band clamps and alignment of all the pieces certainly made it impossible to produce on a regular production line. It could be done simpler. But it was the centerpiece of the car – a Ford masterpiece – and a real reason for an enthusiast to open the hood. This type of intake manifold would make an enormous difference on an engine with the breathing capability of the Coyote – and power would be increased everywhere across the band. The expense of producing this in aluminum would be high – probably too high for the aftermarket. A phenolic plastic intake, made of the same material as the Coyote engine, would be easier to produce, easier to tool up for, and smoother insider than aluminum would be. And it would run cooler. So what does Ford provide for the enthusiast now? A simple scroll-type intake, efficient but not outstanding. And a plastic cover over the engine… which looks like a marketing department’s view of the exotic intake manifold this engine is calling out for – and worthy of. 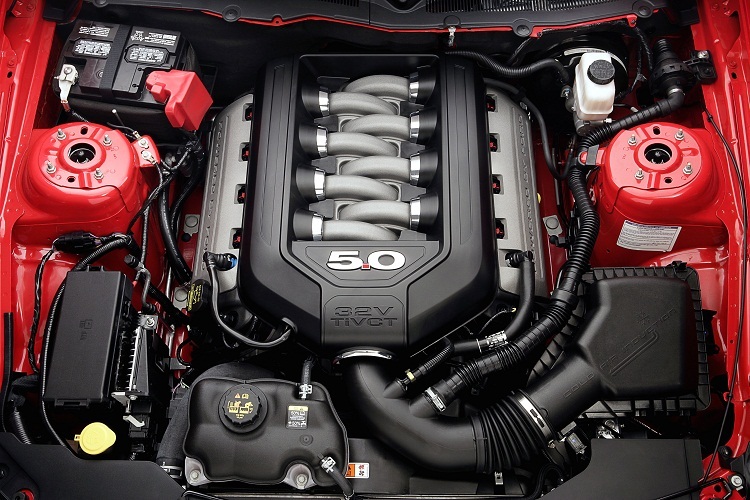 The fake intake, chrome band clamps, and aluminum-colored intake look shameful on top of this engine.